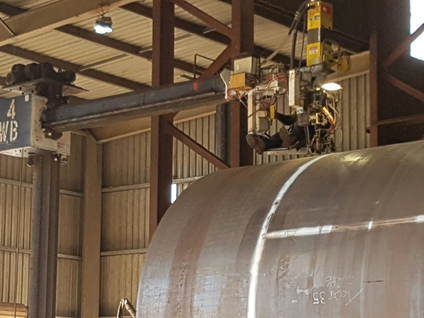 In order to avoid these problems and ensure the highest possible quality, welding processes must be monitored closely. When automated welding processes were first introduced, fabricators stationed an operator in a chair atop a welding machine, such as a column and boom welder, to visually monitor the welding process directly. Surprisingly, this is still a widely used approach to weld monitoring! An empty chair waiting for the operator…. 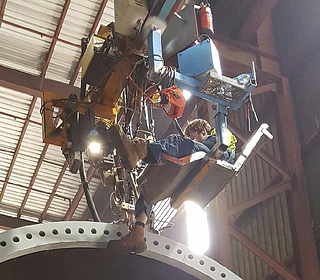 Even today, there are fabricators who are unfamiliar with automated inspection process and are forced to place an operator on a chair high above the welded pipe to monitor the welding process. This is a health and safety problem waiting to happen! Not only does the operator face fume inhalation, they risk injury from moving equipment, inadequate protection and dangerous heights. Can you see the Operator monitoring the process? In addition to the safety concerns, work breaks are a major drain on productivity. Just think of the production time lost while moving the gantry robot or hoisting equipment down so that the operator can safely exit the equipment at ground level, not to mention the idle time until the operator returns to their position. This isn’t the first time Xiris has run into a duct-taped welding shield and it won’t be the last. 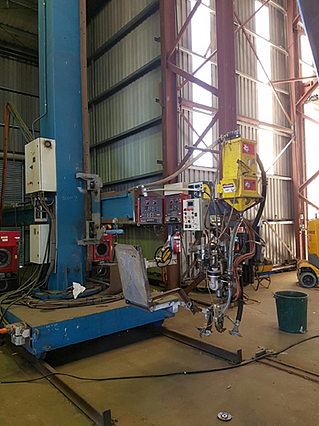 A manufacturing company, welding high quality products on a seamer has recently made some major upgrades. What other single upgrade can so easily and cost-effectively increase quality, raise productivity, reduce health and safety risk, and improve working conditions for your operators? 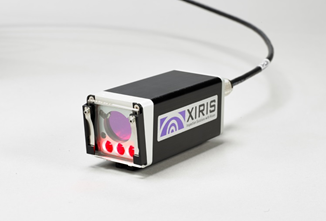 A Xiris Weld Camera can be retrofitted on virtually any seamer in minutes. Why should your customers buy from you rather than your competitors? It can be easy to take for granted that your processes are more efficient, your production environment healthier and your service levels higher than your competitors. However, if your customers don’t recognize your advantages, you could be missing out on an opportunity to gain a competitive edge - and increase your sales. How do you communicate with your customers in order to stand out from the crowd? If you make a product for the welding industry, a novel approach is to use the Xiris Weld camera to produce stunning videos of your unique process to clearly demonstrate what your product does. Using the Xiris Weld camera, you can acquire high contrast, clear images that show off the processes that make your product special. 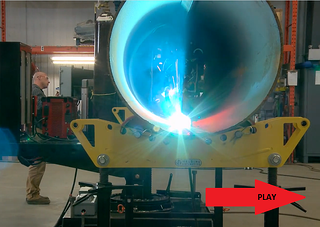 Using a Xiris Weld camera to image your product’s welding process is an inexpensive and quick way to help your customers visualize the benefits you are offering them. Recorded video is easily generated, eliminating the need for expensive production facilities, animation or computer graphics. Imagine for example that you have developed a new or improved magnetic oscillator technique and you want to show it to the world! What better way than to record a video showing the problem to be solved and the process resulting from the application of your product. Not only will the Xiris Weld camera improve your own welding processes, it can be a powerful marketing tool as you seek to grow your market share. When a customer refuses to accept a shipment because of a quality problem, the cost escalates as soon as the tube leaves the plant. The cost of customer returns includes all product that gets returned from, rejected by or credited to a customer. It also includes the expense of sorting, investigations, meetings, reporting, shipping, handling and containment. The tube producer may have to rework the product until it meets customer expectations, scrap it or, worse, send a team to the customer’s site to inspect each piece manually. 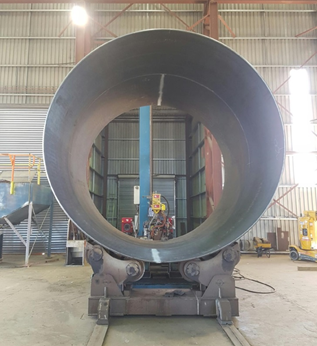 By adding weld inspection into a tube production line, the rate of defect detection will be higher as the weld inspection system will be able to detect, at a high level of accuracy, defects that are not easily detected by NDT equipment or manual operators. With higher defect detection rates, better quality product will be shipped, ultimately reducing customer returns. 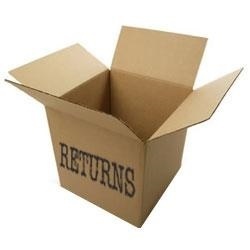 Reduce your customer returns! Justify an automatic weld inspection system using a ROI worksheet where you can enter your own mill data. Download your FREE ROI Calculator Now! I had the pleasure of meeting Mr. Chris Code back in May of 2016 at the Skills Ontario Competition for Secondary Schools, the largest of its kind in Canada. Chris is a teacher and weld instructor at Timiskaming District Secondary School (TDSS) and he had students participating in the event. TDSS offers a special program in Northern Ontario called the Specialist High Skills Major Program (SHSM) in manufacturing. The program gives students exposure to the many careers associated with manufacturing. Students work with CAD tools, hand and machine tools as well as welding and fitting on community based projects. Students can also work toward CWB certification. Chris was in the process of deciding between the purchase of a weld simulator and a High Dynamic Range HDR) weld camera. He and his students had worked with a simulator and found it to be most beneficial for students who had never welded and could adjust their body position and not waste any welding materials. From his perspective however, students did not really grasp the art of welding with continued use of a simulator. It is beneficial for helping them learn the angles and distances for holding a torch, but beyond that it’s just not realistic. 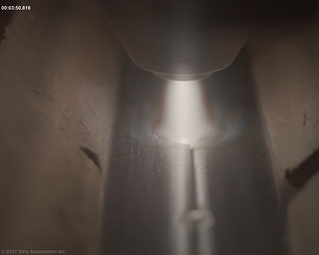 With a weld camera, students can see how the arc and puddle react to different techniques and procedures, not just have simulated scores pop up. Another benefit of a weld camera is the ability to record examples of any defect and show the students how it was formed. 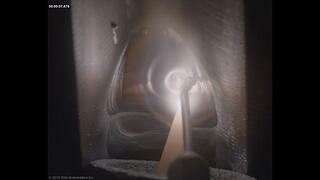 The camera can see the torch angle and position while at the same time show detail in the weld. A simulator can’t provide that much detail or immediate visual feedback. Students can record their welds and go over them with Chris after the fact for feedback, particularly helpful in a multi student setting where immediate individual attention is not always possible. 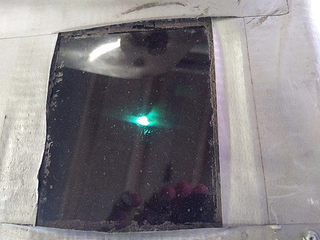 With the XVC-1000, Chris and his students are able to change the optics of the camera to alter the field of view to allow for a small magnified view of the wire going into the puddle, as shown in the TIG images below, to a larger view to record the weld of an entire 8” coupon, seen in the stick welding image. Beyond the use of a weld camera as a teaching tool, Chris determined there were additional benefits attained with an in-house weld camera. By having a HDR camera, students are able to learn about camera technology, as Chris allowed his students to play a lead role in camera set up and software configuration as he felt they will be exposed to more vision systems in the future. Chris also intends to work closely with the school’s marketing teacher to use the images captured to market the welding component of the SHSM program. Thank you Chris, it has certainly been a pleasure to work with you and we intend to keep a close eye on your progress!! Xiris has a great collection of weld videos, sorted by process, that have been created using the XVC-1000.